Bardon Contracting were able to utilise their expertise in airfield construction to ensure the tight scheduled supply and construction of the project was met. 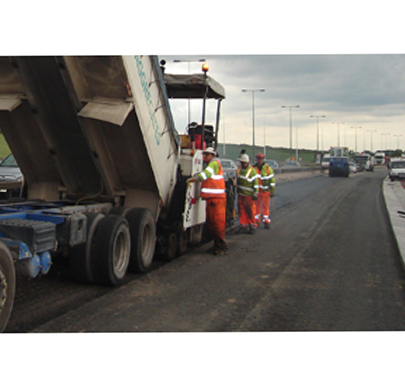 Aggregate Industries supported the MVM JV (Morgan Est/Vinci/Sir Robert McAlpine) in the execution of the M1 widening contract between Junctions 25 to 28 in the East Midlands. Moxon Traffic Management and Bardon Contracting were appointed at tender stage to support MVM JV in both the pre-construction and execution of the works. Moxon Traffic Management provided a broad traffic management service comprising temporary traffic management, temporary vehicle barriers, vehicle recovery, temporary CCTV monitoring and speed detection; using experienced in-house resources and supply chain partners. Bardon Contracting provided an asphalt pavement solution for the construction of an extra lane in each direction; requiring close liaison and co-ordination with other major activities taking place on this project. Asphalt for the project is provided from Aggregate Industries Bardon Hill Quarry. During the pre-construction stage of the project, we provided technical expertise in traffic management and pavement construction to assist the finalisation of scheme designs and programme phasing of the works. Moxon Traffic Management maintained a constant presence on site since works commenced providing routine maintenance, major phase changeovers and emergency response services along the route of the works. Bardon Contracting attended the project in key phases providing high volume outputs peaking at up to 50,000 tonnes in a single month. Robust controls in the co-ordination of our internal supply chain facilitated the efficient delivery of the works, whilst maintaining the very high standards of quality for the manufacturing and laying of asphalt materials. Aggregate Industries Asphalt supply asphalt and bituminous products in the UK.